Véronique Jacques doesn’t just believe in gender equality in the workplace, she lives it. Being the only woman in the Canadian Armed Forces currently deployed in the whole of East Africa, it goes without saying that she is a source of inspiration and courage for the women around her and the other members of the Armed Forces. As a combat engineer officer, she has had an unusual and impressive career. She was named operations officer for the Canadian contingent of Operation Soprano, in South Sudan in 2015 and 2016, an arduous mission carried out with the United Nations. Véronique Jacques impressed her peers, won the respect of her fellow officers and the loyalty of her troops thanks to her competence, leadership and courage. Doing the non-traditional job of combat engineer in a male-dominated profession is a huge challenge for a 29-year-old woman. 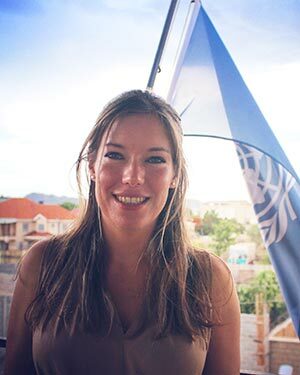 In addition to her basic tasks as operations officer (logistics, planning, intelligence and training), the hard-working Véronique Jacques involved herself in community action for children in South Sudan. For New Year’s she organized a fundraiser to purchase over 100 gift bags that were distributed in three separate orphanages in the capital city of Juba. The gesture not only put a happy smile on the faces of more than 100 children, it also showcased Canada’s international commitment. Since childhood, Véronique Jacques’ determination and courage have fuelled her community involvement. At the age of 19, she was recognized by the Honourable Michaëlle Jean for her community activities. She won the Gold level of the Mérite International de la Jeunesse, also called the Duke of Edinburgh’s International Award Canada. At the time, she was also volunteering for a Québec-wide youth organization. There she shared her passion for her work in the Armed Forces. More specifically, she explained the positive challenges women engineers must meet within the Forces, while pointing out to the girls the importance of choosing a career. Convinced of its importance, this young woman of distinction set herself the goal of helping others to fulfil their dreams, just as she succeeded in doing by holding her head high, and forging ahead. Mission accomplished!